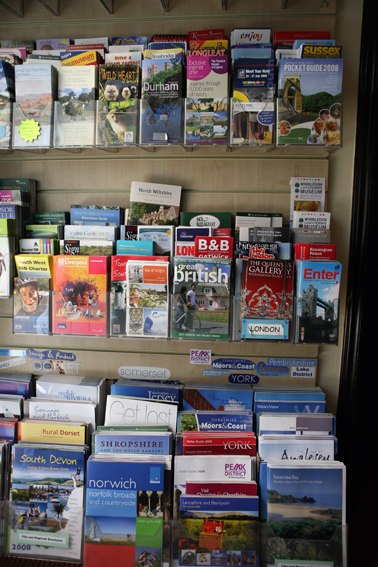 Having frequented countless Tourist Information centres in towns and cities over the past few months, it’s fascinating to see how places market themselves in the hope of attracting tourists. From Broadstairs’ use of Dickens (see my last post) and Suffolk branding itself as Constable Country to the Lake District embracing Wordsworth to Stratford-Upon-Avon employing the strapline “Explore England’s England” (along with Shakespeare Country of course). This issue of how places represent and brand themselves is something I’ll come back to in a later post, but for the time being I just wanted to talk about Margate, the coastal town in Thanet which has become a by-word for rundown seaside resorts and whose recent decline was immortalized in Pawel Pawlikowski’s stark film Last Resort (2000). Margate has an important place in the story of seaside holidays. It vies with Scarborough, Whitby and Brighton for the title of England’s first seaside resort. Since the early 18th century, people have been visiting the town to bathe in the sea, first for health reasons, then for pleasure as it became a playground for some of the wealthiest members of London society. With the arrival of railways, visitors who had been restricted to traveling along the Thames could now explore stretches of cast further afield. However, by the eve of the First World War, Margate was as busy as any resort. The town’s small-scale facilities were soon replaced by large hotels and new forms of entertainment for the hundreds of thousands of Georgian holidaymakers who arrived each year. 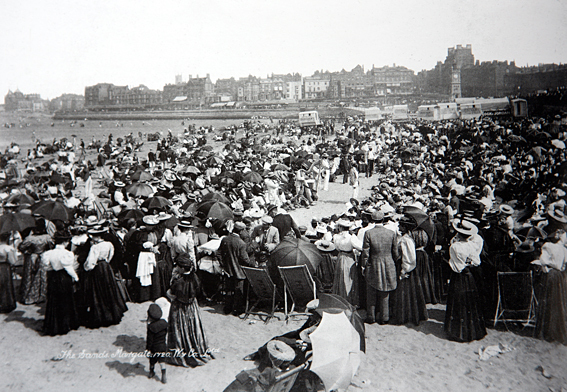 Margate’s sandy beach with a large group of summer trippers entertained by a minstrel show, 1890s. The prosperity of the seaside continued until the 1960s,but with growing leisure time, increased disposable income and easy access to foreign holidays, all seaside resorts suffered decline, though none has probably suffered as much as Margate. The town has experience a vicious circle, with decreasing visitor numbers leading to reduced investment and consequently poorer facilities that again attract fewer holidaymakers. However, it seems Margate has hit upon a plan for renewal which might just help it return it to some of its past glory. The town, along with Thanet and Kent County Council, is turning to art as a vehicle for regeneration and enlisting the help of our most influential painters, no not local bad-girl Tracy Emin (although she is proving quite influential), but rather JMW Turner. Turner (1775-1851) was a regular visitor to Margate throughout his life, drawn by the quality of the light. He once remarked that ‘the skies over Thanet are the loveliest in all Europe’. 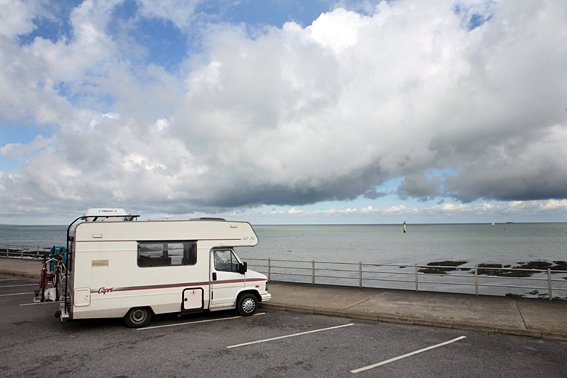 My attempt at a Turner sky, looking out onto the English Channel from our parking space on Margate’s seafront. The Turner Contemporary gallery has recently received planning permission for a building designed by 2007 RIBA Stirling Prize winner David Chipperfield Architects. Work is expected to start on site (which is situated a few hundred meters from the picture above) in autumn 2008 ahead of the gallery opening in 2010. The successful operation of the gallery is seen as playing a key role in the regeneration of Margate’s eastern seafront and the reinvention of the old town as an artistic quarter. As you walk around the town there are obvious signs of change. Many of the rundown buildings I’d seen on my last visit here five years ago are being turned into cafes and restaurants (thankfully few of them major chains) and there are already obvious signs that art is playing an important role with a number of community arts projects and workshops springing up around the town. The old site of M&S on Margate’s highstreet is currently housing off site projects for the Turner Contemporary until its opening in 2010. It is unlikely Margate will ever attract the vast numbers of visitors that flocked there in the 19th and early 20th centuries. However, with growing concerns about the environmental effects of flying and the costs of foreign travel, the English seaside holiday may enjoy some form of revival. For those of you interested in the topic of representation within the tourism industry, there’s a quarterly journal called Tourism Geographies: An International Journal of Tourism Space, Place and Environment, published by Routledge. Affiliations: a Department of Geography, University of Exeter, UK. b Centre for Tourism, Sheffield Hallam University, UK. c Department of Geography, Birkbeck College, University of London, UK. This entry was posted on Friday, June 27th, 2008 at 2:38 am	and is filed under REPRESENTATION. You can follow any responses to this entry through the RSS 2.0 feed. Both comments and pings are currently closed. Is there any chance I can purchase a high res copy of the minstrel show in Margate, img_0124? A busker with an eye to his past.